Art director and photographer Bert Stern’s images of Marilyn Monroe, Cary Grant and Elizabeth Taylor personified the youthful and provocative 1960s. Remembered as one of photography’s finest, Brooklyn-born Stern is most revered for his celebrity and commercial work. In 1962, Stern photographed actor and social fixture of 1960s Italy, Walter Chiari, alongside model Monique Chevalier as she sips a glass of Chateau Lafite-Rothschild. Chiari appears entranced by his companion, whose focus is on her drink rather than the man seated across from her. The image was published in the year’s April issue of Vogue and proved seminal to the photographer–who would recreate his own image nearly 40 years later. In 2010, Stern was commissioned to photograph Stella Artois’s ad campaign, re-staging his famous 1962 image for the Belgian Beer company. The two photographs appear nearly identical — with the obvious exchange of beer for wine. Walter Chiari and Monique Chevalier by Bert Stern for Vogue April, 1962. 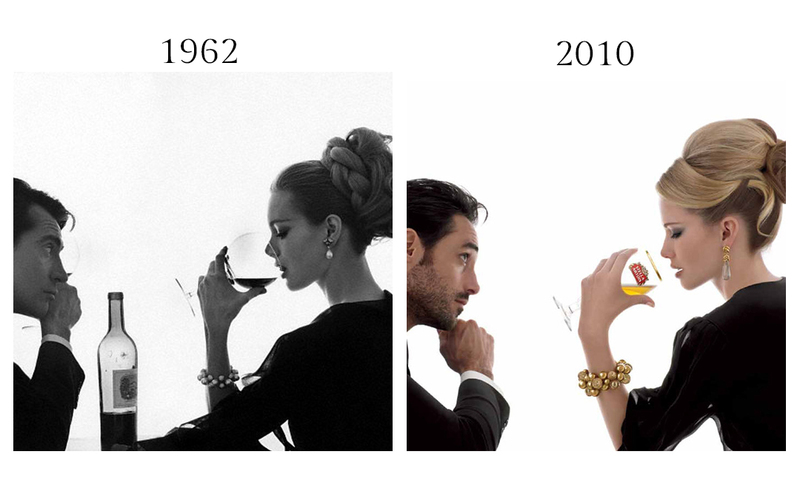 Bert Stern for Stella Artois, 2010.